The countries of the Mediterranean Basin experience varying conditions regarding availability of water resources and needs, highly increased by irrigation, development of tourism and improvement in living standards. The Mediterranean climate is characterized by a yearly precipitation, comprised of between more than 1000 mm for the northern countries and less than 400 mm for some of the southern countries and by a potential evapotranspiration often higher than 1200 mm implying a hydro deficit which is often high. The hydrological regimes are marked by strong inter season irregularity. The available soft water resources are often difficult to accede, being fragile and poorly distributed. This can result in conflicts of interest and difficulties in sharing the available resources and in preserving the environment for any length of time. More than 200 million people live on the area drained by the Mediterranean, 150 million of whom live on the coast. This situation is reinforced by a seasonal, tourist and migratory flow of more than 100 million people. Agriculture often requires water provisions in order to irrigate the crops. Presently, more than 16 million hectares are irrigated with a growth rate of 200 000 hectares/year. The global water consumption is about 16 times higher than the urban consumption. Thus, if on the global level, 70% of water mobilized resources are destined to the irrigation, this ratio already reached 90% in certain countries of the South and the East of the Mediterranean basin. Besides, the urban discharges in the Mediterranean estimated around 2.5 billion m3 per year whose 1.5 of which are linked to tourist activities endanger the quality of water resources in the coastal area and represent the main source of pollution in the sea. The exploitation index proposed by Jean Margat (1997, Blue Plan) is the ratio between the quantity of mobilized water and the quantity of renewable water. This is an indicator of the pressure on water resources and of the difficulties that face the countries to satisfy their water needs. Five countries, or territories, have an index that approaches or exceeds 100% : Egypt, Israel, Malta, Palestinian territories, and Libya. It means that these countries use no renewable resources and/or non conventional resources as desalinization or reused water. The present and future problems and tensions depend on the evolution of the quantity of available water per inhabitant. 2000 m3/year/inhabitant is the threshold under which a worrying situation may occur. The state of complete shortage is defined as being underneath 1000 m3/year/inhabitant. Now, several southern countries are already facing this situation such as Malta, Libya, Israel, Tunisia and Algeria . Cyprus, Lebanon, Syria, Egypt and Morocco might join them in 2025. In many cases, to face these issues, new resources should be identified locally (ground water exploitation, desalinization, waste water reuse) and transfers of water are considered from one productive region to another less supplied. In any cases, it is generally admitted that the management of the water demand will be one of the mains keys to solve the issues concerning the balance between the water resources availability and the satisfactory of the needs. However, in this context of scarcity, a better assessment of the qualitative and quantitative evolution of natural and usable resources both in space and time is more and more required. In fact, water assessment, monitoring and management is dependent on the existence of reliable water resources information systems at national and regional levels, covering not only the collection and analysis of data but also the exchange and dissemination of these data and related information to the users, ranking from the general public to the decision makers. Regional data are also needed for water cycle models considering the global change effects and local physical impacts (deforestation, cultivating new land, construction of large-scale works, irrigation, etc.). Besides, there are many important shared rivers and groundwater basins which require regional co-operation for adaptation and integration of water "information systems" favoring the use of drainage basin simulation and management models. Considering these facts, in the Mediterranean area more than elsewhere, having an excellent knowledge of hydro-meteorological phenomena and hydrodynamic processes of water supply in the different stages of the hydrological cycle is necessary to assess the variability of available resources in space and in time, to measure the impact of human activities and/or climate change on water availability and to favor co-operation between the border countries. To reach this target, the World Meteorological Organization (WMO), in association with the World Bank, launched in 1995 the Mediterranean Hydrological Cycle Observing System (MED-HYCOS), based on a global network of reference stations with real-time satellite data transmission, to contribute to the development of consistent, high-quality and constantly updated distributed national, regional and international data bases on river flow, water quality and certain climatic variables. The MED-HYCOS project proposes the development of a regional approach by encouraging the co-operation between hydrologists through the development of common activities. The participating countries will therefore consider their national problems in a regional context, this is particularly valid in the case of border region resource areas. The promotion of using modern technology is not an end in itself, it is a way of re-enforcing the capacities of the management services from the observation networks and to ease the setting-up of a high quality, operational, regional data base. Water resources management and assessment are based on a coherent analysis of series of observations over a long period and the providing of information in real time or slightly later. The MED-HYCOS hydrometeorological Data Collecting Platforms network (DCPN) would be considered as a reference for other national hydrological network. The initial phase (May 1995 - May 1999) is being executed by the countries partners with the help of WMO and with the financial support of World Bank. Mediterranean Sea Basin: Albania, Algeria, Bosnia-Herzegovina, Bulgaria, Cyprus, Croatia, Egypt, France, Greece, Israel, Italy, Jordan, Lebanon, FYR Macedonia, Malta, Morocco, Palestinian Territories, Portugal, Slovenia, Spain, Syria, Tunisia, Turkey, Yugoslavia (24). Black Sea Basin: Georgia, Moldavia, Romania, Russia, Ukraine (5). Presently, twenty five countries are collaborating and participating in the MED-HYCOS project at different levels of commitment. The Regional Co-operating Group (RCG) is composed of officially designated representatives of the participating countries, regional organizations concerned, funding agencies and donors, as well as the World Bank and WMO. RCG is responsible for defining strategies, making technical choices and implementing the project. Objective 1: Installation of a network of key stations of multisensor-equipped Data Collecting Platforms (DCPs) storing and transmitting hydrometeorological data. 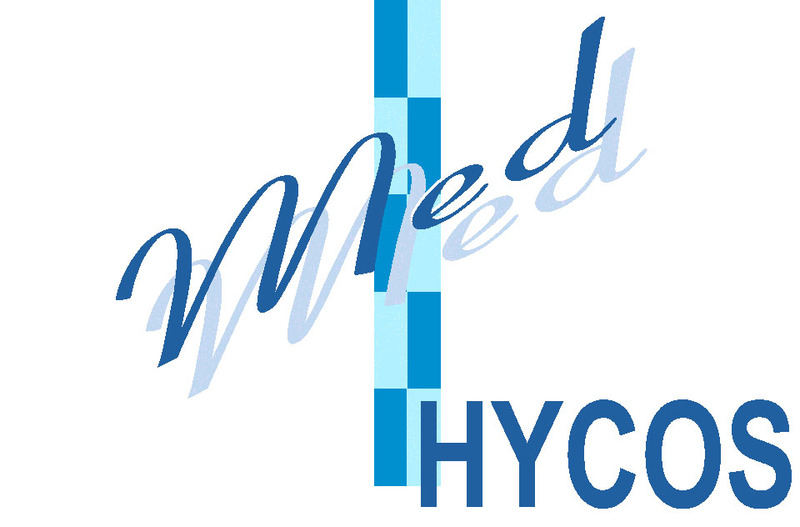 Objective 2: Development and implementation of the MED-HYCOS Information System. Objective 3: Improvement of national hydrological services and networks notably through provision of new equipment and development of related training programmes. The Research Institute for Development (RID ex ORSTOM) is hosting in Montpellier (France) the MED-HYCOS Pilot Regional Centre (PRC) in charge of co-ordinating and leading the project with the support of Regional Task Forces with experts from participating countries. The Pilot Regional Centre acts under the authority of the Regional Co-operation Group. The host country for the PRC provide : office space and part of the furniture for the PRC, a scientific and technical team and its salaries, and part of the recurrent costs. Other costs are supported partly by the project, partly by the participating countries . The Initial Co-ordinating Group (ICG) helps the PRC in the conduct of the project. ICG is presently composed by Bulgaria, Cyprus, France, Italy, Malta, Romania, Slovenia, Spain, Tunisia, regional organizations concerned (FRIEND-AMHY, MEDIAS-France, RID, VERSEAU) and funding agencies and donors. 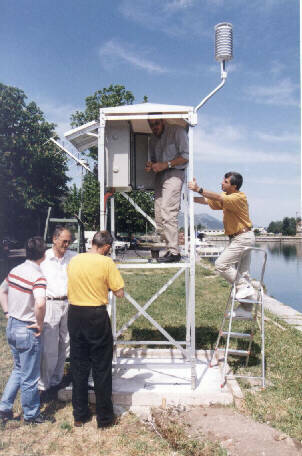 The first immediate objective of the project to collect hydrometeorological data in order to follow the evolution of resources on main Mediterranean rivers, to face the International and transboundary water issues, to evaluate the terrestrial pollution flows from the catchments to the coastal zones of the Mediterranean sea, to evaluate certain terms of the hydrological cycle at different watershed scales (runoff, evapotranspiration), to monitor the management of dams and the transfer of water between different areas, etc. The designation of the sites to be equipped with the MED-HYCOS Data Collecting Platforms (DCP) is the responsibility of the countries according their own interest. However, it is recommended the MED-HYCOS DCPs are chosen amongst the existing stations of national networks according to the stability of their gauging and the length of their observation series. Twenty Data Collecting Platforms (DCP) are functioning in the following countries: Albania, Bulgaria, Croatia, Cyprus, Jordan, Lebanon, F.Y.R. Macedonia, Malta, Morocco, Slovenia, Tunisia, and Turkey. Every three hours, the DCPs are transmitting hourly data on water level, water temperature, air temperature and rainfall. These DCP are manufactured by CEIS-TM (Toulouse France) according with the specifications requested by MED-HYCOS project, especially for remote monitoring. The main characteristics of these DCPs are : METEOSAT transmission (or GOES/GMS, ARGOS, INMARSAT, modem), Self power supply with solar panels and battery, Additional capacities for meteorology or water quality monitoring (17 sensors), Easy installation and maintenance, etc. Certain countries like Italy, France, Romania, Slovenia, Spain and Romania transmit to the Pilot Regional Center near real time data from about thirty hydrological stations. The MED-HYCOS Information System (MHIS) is constituted by all information related to the National Hydrological Services and to the MED-HYCOS activities and by the Regional Data Base. The Regional Data Base is composed by the data collected in real time from DCPs, data coming from near real time sites and historical data (especially daily and monthly discharges) from other sites chosen by the countries representatives. The Regional Data Base is managed by the Data Base Management System ORACLE interfaced with Internet. Thus, the MED-HYCOS Web site presents hydrological data on more than sixty stations ; for about two third of them, data are updated every week. Above all, several useful tools available in free access on the Web Site have been developed in order to check, to examine and to visualize the hydrometeorological data. Data managed on the server are transferred to CD-ROM while preserving their organization. Thus, the MH tools are used to process data through the Web Site or on CD-ROMs or on hard disk. So, the MH tools can be applied to process national data outside MED-HYCOS regional context. By promoting the use of modern technologies for data acquisition, transmission and information processing and dissemination, by promoting the exchange of information, data and skills among the countries participating in the project and by strengthening the capacities of their National Hydrological Services, MED-HYCOS is one of the initiative which contributes to water resources assessment and management in the Mediterranean region.